After driving for four-and-a-half hours from Rongshui on unpaved mountain roads, one might find themselves in Liangsong Village. Dogs and chickens roam freely on the dirt roads. The women wear traditional Miao clothing – with bright colorful leggings and patterned blouses. The elderly men smoke tobacco out of a long wooden pipe. It is a different world entirely than the economic booming cities like Shenzhen and Guangzhou. The modern economic success of China has yet to reach the 78 families of Liangsong. This village, like many in this area, is made up of farmers. When looking at the vast valley that lies beneath Liangsong there are rice fields as far as the eye can see. However, nowadays the available farmland is quite limited. It is estimated that there is only 320 square meters per person, which yields very low profits. 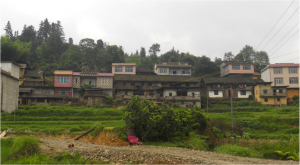 The lack of available land, as well as the isolated geographical location of Liangsong makes it one of the 13 poorest villages in Rongshui autonomous county. The average annual income per individual is between $250 and $300 which is significantly below the poverty line. The ethnicity of Liangsong is Miao which is a minority group in China. The Miao have a distinct appearance, culture and language that is considerably different than that of the Han Chinese. children, however the government does not provide money for transportation. In isolated regions, such as Liangsong village, the nearest school can be up to an hour away by car and three hours by foot and so many children stay at home. However, the greatest threat to the livelihood of the people is the lack of clean water. The people draw water from a ravine that is 1.2 kilometers away. This water source is clean enough for drinking except during the rainy season where landslides cause the water source to become dirty and discolored. Between the rainy months of March and August, Liangsong is extremely vulnerable to sickness and disease. The piping system that is currently being used for water is an equivalent health risk as the contaminated ravine. Because of the cold climate during the winter, much of the polyethylene (PE) piping freezes over which causes cracks. In order to reduce the waste of leaking water the people replaced the PE pipes with rubber tubing. These rubber tubes were formerly used for irrigation in the rice fields and are filled with pesticides and cancerous agents. This problem needs to be addressed promptly in order to avoid further harm for the people of Liangsong. A mountain that is 3.4 kilometers away from Liangsong has a fresh water spring that could be the answer to the water crisis. A reservoir is needed to collect the clean water, along with 3,400 meters of new PE piping. The total cost of this project is $14,600. The people of Liangsong have pooled $3,300 of their own finances together to contribute to the construction of this project. China Care International would need to pay for $11,300 to make clean water a reality. Something as simple as pure water can instantly improve the livelihood and productivity of Liangsong. This project would not only give the people fresh water but also benefit the livelihood, productivity and economic development for generations to come. The scene in Shang Luoyou Village is quite different than that of the large metropolitan cities in China. Small, single bedroom homes seem to be one step shy of toppling over. Men haul their crop using wooden planks that are balanced on their shoulders. Much of the wealth and modern economic success of China has yet to reach Shang Luoyou due to the village’s isolated location and dangerous unpaved roads. These roads are hard to navigate on a good day, and on a rainy day it is nearly impossible. The loose soil on the steep hillside can quickly turn into landslide and completely block the road. This leaves Shang Luoyou in economic isolation as the people are unable to sell their goods in the marketplace. There are just 33 families, amounting to 137 people in this village. Miao is their ethnicity which is a minority group in China. The average annual income of the people is approximately $330 a year which makes Shang Luoyou one of the 13 poorest villages in Rongshui autonomous county. The primary trade of Shang Luoyou people is farming rice which can be labor intensive and yields low profits. There are several needs that the Shang Luoyou people possess. The most pressing however is their need for clean water. Currently they are drawing water from a nearby creek that is 1 kilometer away. This creek remains clean and clear for much of the year. During the rainy season, however, the river changes color to a dark yellow color as the mud from the hillside slides into the creek. Without clean water the village is in grave danger of sickness, and with their remote location, they are not near any hospital or clinic for treatment. A fresh water spring that is 2,400 meters away from Shang Luoyou has been located on a nearby mountain. By building a reservoir and providing 2,400 meters of piping this village can have a safe and secure source for clean water. The total cost of this project is $15,800. The people have pooled their resources together to raise $2,100 – which is a significant amount for this village who lives far below the poverty line. China Care International would need to provide the remaining funds which are $13,700 to put these plans into effect. CCI has been able to assist many villages in the Rongshui autonomous county with clean water projects and it is our desire to do the same for Shang Luoyou. This water project will not only provide a source for clean water but also a source of hope for the Miao people of Shang Luoyou. The collective culture of the Miao people can be clearly seen in the village of Xiao Xi. Back porches and front doors of small homes are scarcely divided, the farmers work together on shared rice fields, wooden chairs line the public walkway. There are 36 homes and 146 people in Xiao Xi. It is located in a cold mountainous district and the road leading to the village is unpaved and can be very dangerous. These factors have contributed to the delayed economic development of Xiao Xi. The annual average income for an individual here is 2,200 RMB which is about $350. Xiao Xi is entirely made up of the Miao ethnic group. The Miao people are considered a minority group in China and have a unique culture that is distinct from the Han Chinese. The primary occupation of Xiao Xi people is farming and during the day the village is emptied as farmers tend to their rice fields. people have no other choice but to cook, clean and drink with this water. In doing so, they are in great risk of sickness and their immune systems are weakened. Without any kind of hospital or clinic nearby, it is of utmost importance to keep good health in Xiao Xi. CCI has been a part of several clean water projects in Guanxi province and is prepared to answer the water crisis in Xiao Xi. About two and a half kilometers from the village is a spring that has the clean water that Xiao Xi desperately needs. The plan is to build a reservoir that is 30 meters cubed that will collect the water. Polyethylene piping will carry this clean water for 2,600 meters to Xiao XI. The total cost of this project is about $15,400. The people of Xiao Xi have contributed $1,500 – which is a significant amount living off of less than a dollar a day. CCI would need to cover the remaining $13,900 to put this plan into effect. Clean water is a human necessity and CCI is honored to assist in providing this need for the people of Xiao Xi. Access to clean water will instantly improve the quality of life for this small mountain village. Guangxi is a beautiful provence full of beautiful people. Unfortunately, it is also one of the poorest areas in China. 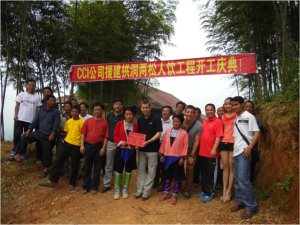 In 2011, CCI committed to work together to build a water sanitation project and a road in Guangxi Province. According to a 2010 Guangxi Government survey, Rongshui County currently has a total population of half a million people, 71% are from minority groups, and 39.14% of all the population are made up of the Miao Minority group. 860 villages are not accessible by road and 123,300 people still do not have clean water! There are 320 villages out of the 860 villages that make up Rongshui County that do not have electricity or adequate electricity! The primary income for the area is farming. The average farmer in 2010 in Rongshui County made less than 400 USD per year. That is just over $1 USD per day. The average income per adult is only $120 USD per year. 46% of the population in Rongshui country fall into the income level of less than $120 USD per year. 119 Kilometers from the town of Rongshui (going north) is a town called Yaoliang Tun. There are 205 families that live in this village with a total population of 981. The farmers of this village are not able to get their goods to and from the market because they do not have adequate roads for vehicles. The difficulties with the roads contributes to the increased cost of their products and often prices them on the high side of the competition. In order to connect to the main road, they needed to build a small road of 2km. CCI worked together with them to build the roads that they needed. Just down the road there is a small village called Toudaogou. This village is made up of the Man Minority (pronounced “mon”). This is the first time that CCI has ever worked in this minority group in China. According to a 2009 study in Rongshui county, it was found that more than 60% of the population does not have access to clean water. A survey team was sent out by the government to explore why this was the case and they found that many of the sources that was used in the past had dried up and it takes considerable resources to find and access new ones; resources that the people of Rongshui just dont have. There are currently 46 families of 216 people living in Toudaogou Village and they do not have access to clean water. The nearest area that the villagers currently have to get water is more than 2 miles away. 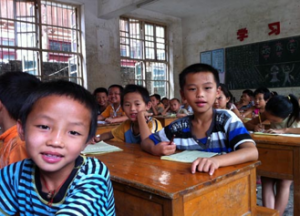 With your support, China Care International completed both of these projects this year. The road will help increase the villagers standard of living by increasing their ability to earn a living. The water project will help alleviate their poverty in several ways. It will decrease the amount of waterborne illnesses, decreasing the drain on finances and man power caused by them. It will also increase productivity by decreasing the time and energy used to get daily water needs. From the people of both villages and from CCI, thank you for your help in these areas.